Wherever Tutubi goes, he looks for something new, something different that a place can offer to visitors, tourists and explorers. He laments though that most of the time, most locals don't know the answer but he plods on searching for new "discoveries." In Surigao, he asked around for surigao delicacies, kakanin or unique food and got one good answer: the sayongsong. The sayongsong, as it turned out, is a kakanin wrapped in banana leaves with looks and consistency similar to puto (rice cakes), it's made in Surigao (and some parts of Caraga region) from glutinous rice, calamansi juice, brown sugar, roasted peanut, as well as coconut milk. 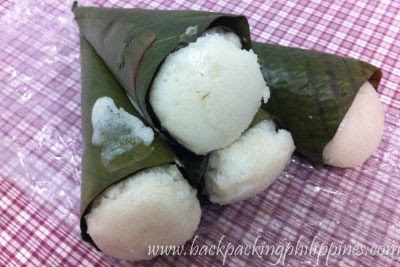 sayongsong: it's like puto with cononut milk wrapped in banana leaves. Tutubi was able to sample sayongsong when his friend bought a bunch for him to sample, reportedly costing P20 (such cheap price for a filling bunch). You can't find this pasalubong in Surigao Airport, just look for it at roadside stalls and public markets. Surigao is a very nice place where you can enjoy your vacation holidays. There's a lot of tourist spot..See you soon in Surigao. hospitality and tourism industry is really booming.